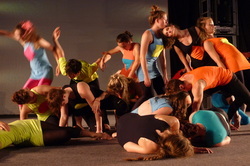 Projects featured on this page are all original performance works presented by fLiNG Physical Theatre from 2001-Present. In addition to these works, fLiNG has also presented short works programs on an annual basis, including work by fLiNG Artists, Alumni and Guest Artists, original performances created with YfLiNG and FLUX Creators, and numerous commissions for partners including the Bega Valley Regional Gallery and Four Winds Festival, among others. For recent work see Current Projects. 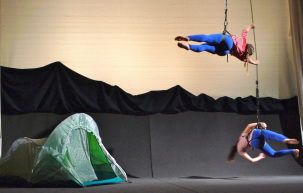 Celebrating 10 years since fLiNG Physical Theatre's Who will come to the Rescue?, We will come to the Rescue combined dance, physical theatre and gymnastics in an action packed show. The 2016 fLiNG Company transformed into superheroes and super villains, exploring and embracing the themes and cliches of the superhero genre, to ask what will our current generation of young people do to save the world? We will come to the Rescue was presented in Bega and toured regional NSW to Yass, Bathurst and Dubbo, where it was presented at ARTLANDS National Regional Arts Conference. Direction/Choreography - Rob McCredie, Choreographic Collaborators - Alexandra Harrison, Nick Power, Leif Helland, Gabriela Green, Sound Design - Braydon Zirkler, Lighting Design - Gerry Corcoran/GCLX, Rehearsal Direction - Lee Pemberton. Place, space or state of mind? Where do you hang your hat? 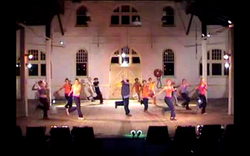 Home was a unique collaboration of five local professional artists, and a large cast performers ranging from 14-80 years. Drawing on interviews with the local community, Home painted an eclectic picture of what it means to be at home in the Bega Valley. Featuring original songs by Heath Cullen and a large community choir, Home toured locally within the South East NSW region, with presentations in Bega, Bermagui, Merimbula and Eden. Direction/Choreography - Gabrielle Rose, Musical Direction/Composition - David Hewitt, Co Direction/Choral Direction - Dan Scollay, Lighting Design - Gerry Corcoran, Songwriter/Performer - Heath Cullen. 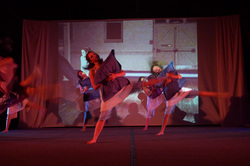 Rule of Three brought together short works made by three choreographers with strong connections to fLiNG. Curved Lines, by fLiNG Alumni Ruby Dwyer, explored the communication pathways of the body. Speech, by Youth Company Director Rob McCredie, used movement and text to explore how much of the truth we are willing to share. Socialsize Me, remounted ahead of a tour to Highschools in the South East Region, explored the use and abuse of social media. Socialsize Me was remounted by Lee Pemberton and Gabrielle Rose, with lighting Design by Gerry Corcoran GCLX. Socialsize Me explored the impact of technology, social media, facebook, and text, and their affects on our everyday lives and relationships. Direction Lee Pemberton, Associate Director Gabrielle Rose, Choreographer Adam Wheeler, Assistant Choreographer Ryl Harris, Sound score Braydon Zirkler, and Lighting design Gerry Corcoran GCLX. Smoke Signal combined dance and percussion exploring the rhythms of movement and sound. Collaborators Lee Pemberton, Gabrielle Rose and David Hewitt with Biamanga Percussion and the fLiNG Company. Inspired by exploratory expeditions of the late nineteenth century and the lived experience of the present day inhabitants of the remote far southeast of NSW, The Idea of South was a performance of human endurance and physical extremes, suspended on the frozen edge of the earth. Direction & Choreography - Alexandra Harrison & Rowan Marchingo, Aerial Direction & Design - Tully Ward, Sound Score - Bob Scott, and Lighting Design - Gerry Corcoran. Inspired by historical journeys, treacherous voyages and survival stories of the wild oceans of the Far South Coast of NSW, The Voyage was a movement and dance play, utilising the possibilities of aerial dance to explore the huge force of a magnificent storm at sea. 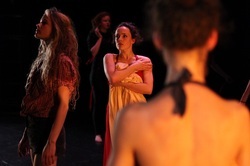 Directed by Lee Pemberton in collaboration with choreographer Fiona Malone. Sol's Way follows the experience of Sol on his journey to find himself. The characters explored motifs and imaginings from life's journey and death, using memories of childhood games, camping trips and the beach. Directed by Don Asker with choreography by Jane Mortiss. Drawing on comic book super heroes, Who will come to the Rescue explored science fiction story telling. After an experiment gone wrong the evil Flyman attempts to take over the city, by attracting Gangsters, Gargoyles and evil super heroes to his side. A classic tale of good versus evil, this show encouraged the performers and audience to find their inner super hero. Direction and choreography by Lee Pemberton and Kirk Page. 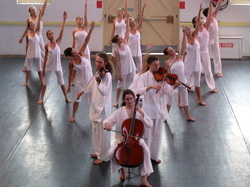 Canon was inspired by original work written by local composer Geoffrey Badger, and the musical form of a Canon, and featured twenty dancers performing with three young string musicians. Choreographer Helen Linkenbagh, Artistic Director Lee Pemberton, Composer Geoffrey Badger. Sick combined physical theatre, break dance, hip hop and contemporary dance, to capture the energy of youth gangs and skate park fever in a rural landscape. 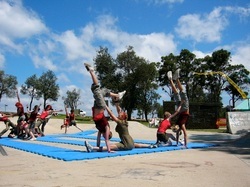 The performance was presented in skate parks from Tathra to Eden and Wyndham to Cooma. A Dictionary of Habitats was a thought provoking study of landscapes and wildlife of the Far South Coast of NSW, inspired by the natural beauty of the region. Direction Lee Pemberton, Projections Stuart Carless, Costume Design Colleen Meessmann. 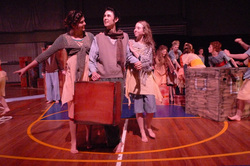 Quiver of the Heart was the first full length production made by Lee Pemberton with fLiNG Physical Theatre. An exploration of space and a meeting of youth culture with contemporary arts.